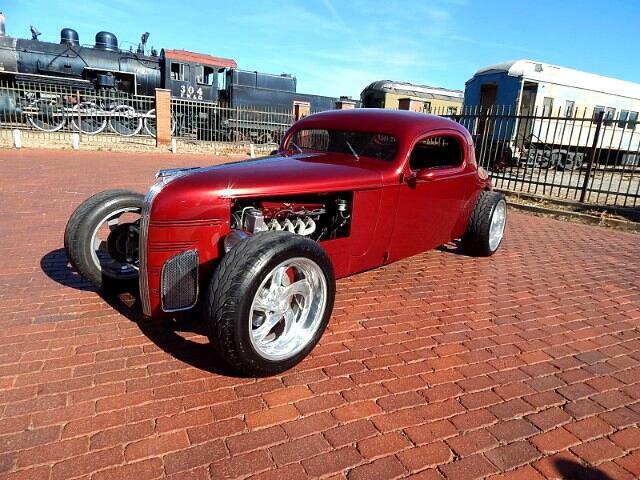 Lone Star Muscle Cars Is Proud To Present This One of A Kind 1936 Pontiac. This Classic Pontiac was a true labor of love to have that one of a kind rod that no one else owned. The Build started in the late 90's and finished in 2003 by Wyman's Auto Body's own Tim Sturges. This All Steel Car Started Out With A Pontiac 421 Motor but now is Powered By a Viper V-10 And Six Speed Standard Transmission Heidts Front End and Rear Suspension. Arden Shocks, Wilwood Disc Brakes on all Four Wheels, Ron Frances Wiring, All Stainless Steel Exhaust System, Air And Heat System, Tilt Wheel, AM/FM Remote Stereo System, VDO Custom Gauges, Power Windows, Power Trunk, 1939 Pontiac Grill, Prowler Tail Light's, And So Much More. This Pontiac Has Had Thousands of hours of labor to turn out this one of a kind car. You will notice Every exterior panel has been redone to accommodate the custom chop top to the raked rear end. Painted In Inferno red pearl makes this car pop. You will notice under the car it has rear independent suspension with the cooling system relocated to rear of this one cool ride. The Wheels on this car were built for it so it is one of a kind. On the interior you will see full leather interior tilt wheel custom sound system. When Cruising down the road this car has plenty of power and low RPM at Highway Speeds. If you are looking for that one of a kind Show Car you can drive anywhere here it is. Message: Thought you might be interested in this 1936 Pontiac Coupe. All Payments Shown Are With W.A.C. @ 6.25 At 144 Months Outside Finance Source. Tax, Title, Registration Extra All Texas Residents T.T.L. Due At Time Of Sale. We Offer No In House Financing. See Dealer For Detail.